Adam is on the Key West based buoy team and is integrally involved in the inspection, maintenance, and installation of buoys throughout the sanctuary. The work is critical for supporting resource protection and sustainable use, as the marker buoys delimit the boundaries of special zones and protected areas throughout the sanctuary, while mooring buoys are used by the public as an alternative to anchoring. Born and raised on the small island of Manhattan, Adam has been on boats since age 5. He has been diving the Florida Keys since 1980, and has spent the last 14 years as a professional mariner and diver in Key West. 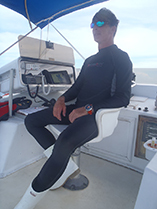 His qualifications include being U.S. Coast Guard Master Captain, dive instructor, and a working diver.